Life has been rather hectic lately and for a minute I stated to fold a little bit. I folded because there was a lot going on. There was a lot of new territory I was trying to get used to. A lot of thoughts, feelings and emotions I didn’t have time to deal with… Well that’s what I thought anyway. The key to life is finding a balance. When you find the ability to create a balance or equilibrium in your life that’s when you’ll feel true happiness. I believe that life consists of different elements and it isn’t very often you can get all those elements to synchronies. Friendships, relationships, family, work, exercise and life admin are just a few of the elements we have to deal with in everyday life. While some of them have the ability to influence your mood more than others. They are all just as important as each other. Life has been super busy lately with a wedding in the family, works been crazy busy, I’ve been trying to blog as much as I can, I’ve been investing time in relationships, friendships and tried to spend as much time as possible with my family. All of these things take time and while I was fine to begin with for the past week I’ve been feeling really flat. I’m not sad or upset just flat. Nothing I did made me laugh, I knew that I was getting stuff done but I wasn’t really enjoying it like I usually do. For 2 weeks I haven’t been for a run. I can’t run very far because I have a dodgy knee. Yesterday I got a text from my friend asking to hang out. When the text came through I was feeling particularly flat. I really didn’t feel like going and watching a movie. Part of me just wanted to go home and blog about how I was feeling but I did what was right by my friend and went and watched the movie. After the movie I decided I would go for a run to try and clear my head because I was still feeling weird. When I got back from the run my mood picked up a little but I felt really tired so I went to bed. The last few mornings have been such a struggle to get out of bed. When I finally got out of bed I didn’t really want to talk to anyone. I knew what I needed to get done and that was all I wanted to do. I didn’t have the energy to have conversations or ask people how they were. This morning however was different. I woke up for my morning smoothy leapt out of bed put on my washing, hung it out and then left for work. I had a super productive day not only getting what I needed done for today but starting to plan the next couple of days as they’re going to be busy. After work I got to my car had a parking fine rather than swearing about it I took to twitter to vent my frustration. But even that didn’t really phase me. Only now have I realised that my good mood today was brought on by my exercise last night. When I was young my mum would always tell me to go and exercise. It will make you feel better she said. I was young, dumb and thought I knew better so never listened to her. It is incredible how much exercise can influence your mood. I didn’t manage to get my run in tonight after work because I was catching up with another friend for dinner so tomorrow morning it starts again. I will definitely be exercising more often from now on! I wanted to share this experience with you because if you’re not feeling yourself it could be as simple as running for 20 minutes. It might be something else and what ever that something else is I hope it isn’t too serious! Try and run and think about it. It’s amazing how much a light jog can put everything in perspective. If you’re still not convinced just know that expectations are unnecessary. You don’t need to put pressure on yourself to feel better or be better. You don’t need to compare yourself to anyone else. 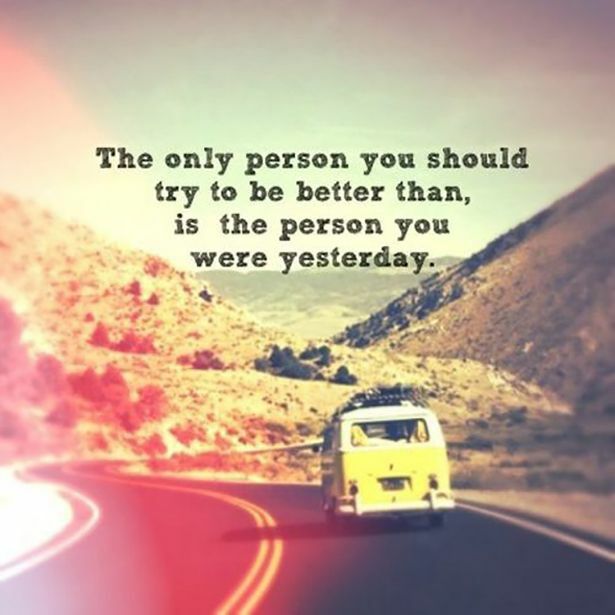 Be better today than you were yesterday and that in itself is enough.